Atlantic City is a city located in Atlantic County, New Jersey, on Absecon Island, just off the coast of New Jersey. Other towns on the island are Ventnor, Margate, and Longport. There are 40,517 people residing in the city. Atlantic City has always been primarily a resort town. Its location in southern New Jersey, hugging the Atlantic Ocean between marshlands and islands, presented itself as prime real estate for developers. The city was incorporated in 1854, the same year in which train service began, linking this remote parcel of land with the more populated, urban centers of New York and Philadelphia. Atlantic City became a popular beach destination because of its proximity to Philadelphia. At its height the city was the vacation destination for playboys and starlets, but the vestiges of these high times are crumbling beside bold new casinos. The efforts to spruce the place up can't hide the fact that Atlantic City is an overdeveloped, dishevelled, ageing beauty who had it all and let it go to waste. After years of experimenting with gambling, the city is still waiting to see how the dice fall. 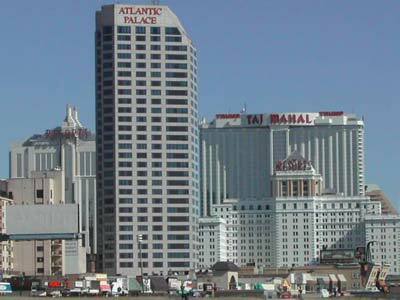 Atlantic City has been a rather frequent subject in popular culture. A 1981 movie, Atlantic City, starring Burt Lancaster, is named for the city. Atlantic City is cited as the Sundance Kid's birthplace in the 1969 classic western film, Butch Cassidy and the Sundance Kid. A popular Bruce Springsteen song, "Atlantic City," depicting a young couple's escape to the city, appears on Springsteen's 1982 album Nebraska. More recently, several episodes of Donald Trump's television show The Apprentice have been based and filmed in Atlantic City. Many landmarks in Atlantic City are featured in the original version of Monopoly. The sticky confection salt water taffy is closely associated with the boardwalks of Atlantic City.